Dr. Rachel C. Azinge is the dental director, owner and founder of the Dental Spa of Texas, in Frisco, an upscale, general and cosmetic dental center, featuring a high-tech medical aesthetic clinic. She received her Doctorate of Dental Surgery (DDS) degree from New York University College of Dentistry in 1997. 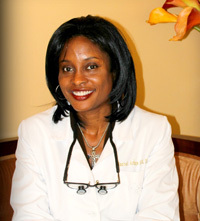 Prior to opening the Dental Spa, Dr. Azinge was a Dental Director at a Dallas based Cosmetic and Family Dental Clinic. Prior to that, she practiced at a couple of general practice and cosmetic dental centers in the New York area. Dr. Azinge is one of an elite group of dentists who personally sculpt patients’ new smiles in sync with facial proportions and personal goals. Her approach to cosmetic dentistry provides her patients with smiles that are not only beautiful, but one that helps them project that image of “all that they can be”. Dr. Rachel Azinge has proven her dedication and commitment to her profession by developing a reputation of excellence, trust and partnership within the Frisco and surrounding communities and shares the ANWEP vision of giving back to our communities. 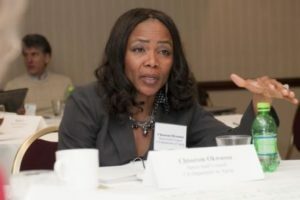 Attorney Chisorom Okwuosa is the Chief Legal Counsel at the State of California department of aging. She has been with the State of California since 1993 and serves as the principal legal advisor to CDA Director and Deputy Directors providing legal advice to CDA Executive Management team and program staff on the most difficult, sensitive and complex program issues in the Department. She is a great advocate for women affairs and a great mentor to our young and upcoming women leaders. She is a strong believer in women empowerment and shares our vision of giving back to the communities that we live and work in. Chisorom understands that success depends on discipline and commitment – commitment to your enterprise, to your personal development, and to growing your effectiveness. All of these commitments result in personal wealth. To her, receiving comes as a result of being a good giver and successful leaders have the DNA to give. 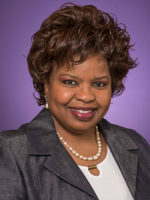 Amiso M. George (Ph.D., Ohio University; Accredited in Public Relations (APR); Fellow PRSA) is associate professor and former chair of the Strategic Communication Department in the Bob Schieffer College of Communication at Texas Christian University (TCU), Fort Worth, Texas. She is the 2017 Public Relations Society of America (PRSA) “Educator of the Year.” She is also the winner of the “2017 Bridge Award for Excellence in Strategic Communication Research.” She consults in crisis communication. Professor Amiso also volunteers her time and talent to teach Proper Etiquette at the ANWEP Confident Girl Self Esteem workshop.